Ideally located at the centre of Reunion Resort, with use of Seven Eagles pool and spa, with gym, children's facilities and table-tennis and also the open air pool at the top of the Reunion Grande Hotel. It is an exclusive resort with superb restaurants and eating facilities and shops nearby for providing all your needs for self catering, it is truly an amazing site with multi-million dollar houses. On Reunion Resort you can also enjoy the health spa, other large swimming pools and activities on-site including a gym, pool and spas and a children's room at Seven Eagles pool complex. Reunion is just 10 minutes drive from Disney and is a short drive to all the major parks, such as Sea World and Universal Studios. Once you visit you will not wish to stay anywhere else in Florida as it is so special. Please visit our website for further details and also pictures of the interior decor of both our homes. Grande Vista is an exclusively decorated 3 bedroom villa which overlooks the 17th tee off from the master bedroom with en-suite bathroom. There is a queen bedroom and also a twin bedroom. The Master Bedroom has an ensuite shower plus double washing basin and toilet. There is also a house bathroom shared between the Queen and Twin bedrooms which has a shower curtain in the bath plus single basin and toilet. then downstairs on ground floor there is a single toilet plus washing basin. There is a leather sofa in the lounge which can also be used as an extra bed, which makes the villa suitable for 8 people to stay. It has a superbly fitted kitchen with every modern convenience. 100 metres away from the villa is its shared pool, which is rarely used by other homeowners on the site. The pool is superb with plenty of loungers and a 104 degree spa. Reunion is a gated site which is very safe and quiet and has superb facilities health spas, restaurants, and excellent hotel on site with an open air pool on the eleventh floor of the hotel. 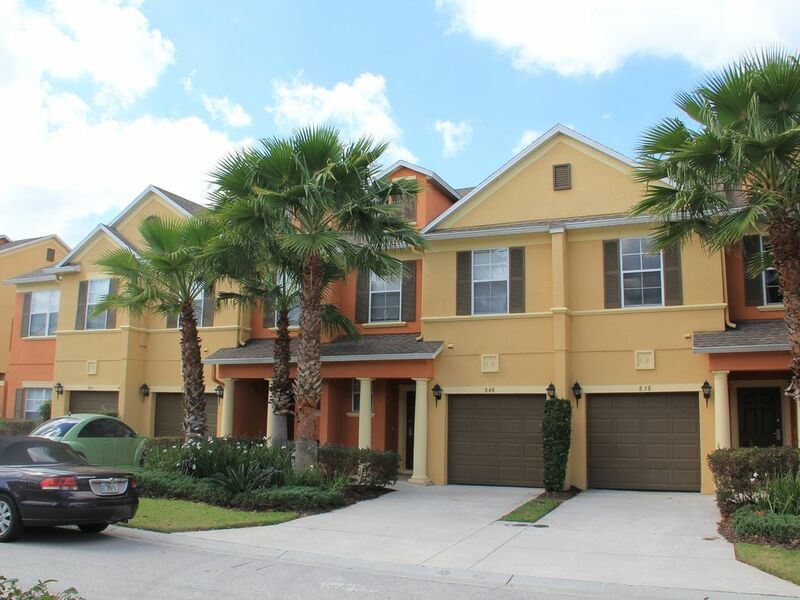 It is very convenient for all the Parks as a short drive to the Interstate 4 road. Notes on accommodation: Grande Vista, 3 bed villa is luxuriously furnished with top of the range furniture, fixtures and fittings. The property is suitable for children. There is parking at the villa. There are numerous restaurants and shops on and just off-site. There is also a shopping area just outside the Reunion Resort. Disney is just 10 mins drive from both villas and other parks such as Universal and Sea World are just a further 10 mins from the villas. Outside: Grande Vista, 3 bed has outside table and chairs and seating area on the balcony overlooking the golf course. There is a superb large pool and spa just 100 metres from the villa, which is rarely used by other residents. The spa is 104 degrees and there are numerous loungers available for use. There are numerous restaurants and shops near to Reunion Resort and on-site restaurants and at the on-site hotel, which is called the Reunion Grand. Reunion is one of the most exclusive and luxurious resorts in central Florida which has to be visited in order to experience the amazing facilities which are available for those fortunate enough to spend their holiday there. We couldn’t be happier with the accommodations. After spending all day at the Disney and Universal parks it was great to come to a clean and spacious place to relax and unwind. The kids enjoyed the pool and having their own space to watch TV. The adults enjoyed the privacy of the master suite and bath. Will definitely book again in the future. A Month's stay was not long enough!! My wife and I stayed at the property for the entire month of Feb 2018. It was with reluctance that we left. The property is just as nice as it looks. It was well appointed with all you need for a condo stay including a very convenient washer and drier. We loved the location and took advantage of the connecting golf cart paths to walk the beautiful golf courses. The price was very reasonable and we corresponded with the owners who were very helpful in getting settled in. I search for something to criticize and come up empty!! I highly recommend staying at this property that was only about 3 or 4 miles from Disney. We truly enjoyed our stay at the villa. The convenience to attractions and inviting interior was perfect for our family with older kids. Great experience we look forward to staying on our next visit. Resort looks very nice and neat. Owner responds on timely manner. Nice resort! Quite and neat! Close to theme parks. Clean, spacious for 4 people. Very quiet townhome community. Convenient location. We spent most of our time at the theme parks, but it was nice to come home to a beautiful, clean hot tub and pool. We had it to ourselves each night we walked down (roughly one block away). The townhome was well equipped and everything was in working order. Comfy beds and plenty of space. We enjoyed our stay and would do it again. There are excellent beaches an hours drive to the East or West of Reunion. Cocoa Beach with Ron Jon's surf shop, is on the East of Reunion and Clearwater on the West Coast. Cape Canaveral can be visited as it is under an hours drive from the villas. Orlando MCO is 40 mins from the villa. Tampa and Sandford are easily accessed from Reunion Resort. Cars are available for hire at the airport but you can usually hire at a cheaper rate if you book in advance online. There is a shopping mall with restaurants and supermarket just a few minutes outside Reunion Resort. There are numerous designer outlets such as premium outlets, which offer designer clothes and goods at low prices, just 20 mins drive from the villa. Other major stores such as Walmart are also nearby. All the Disney parks are nearby with Disney World being the nearest as it is just 10 mins away. There are so many places to visit including the Disney Parks and also major water parks, shops and other attractions, that you could visit Florida year after year and still find so many new attractions and places of interest. Reunion Resort is a wonderful place for a family holiday and an excellent resort for a quiet romantic break away or a golfing holiday with friends. Booking Notes: £65 GBP - £75 per night depending on the season for this luxury 3 bedroom Grande Vista villa. Minimum of 3 nights. £50 GBP / $75 USD cleaning fee is extra if stay is for 6 days or less. Should you wish to know more, then please request a quote and ask any questions. We are also delighted to answer any questions that you may have by email or telephone. A deposit is required to reserve the booking and full payment is required as stated in Owners Direct quote. Changeover Day: The changeover day is completely flexible. Notes on prices: Prices are for the properties per week/per day in UK pounds. All prices are inclusive of tax. Cleaning fee is £50 GBP / $75 USD is an extra if booking is 6 days or less.